■（要）Lesson Plan and Fee レッスンタイプと料金（詳細） – Find your perfect teacher here! ECS customize your lesson plans to achieve each student's study goals. Please let us know if you have special requests such as improving your business conversation, daily conversation, grammar, reading comprehension, writing, accent reduction etc. Photo from ECS Business Conversation Class (Private lesson). This course is designed for business people in Bay Area to learn brisk communication skills and practical business English. When speaking English in business, it is important to be able to create smooth communication patterns. This becomes possible when you earn trust from others by using appropriate expressions and phrases, and by creating positive atmosphere as you speak. To achieve all these, ECS offers you simulation lessons where actual business conversations might take place. ECS instructors strive to individualize each student’s lessons by understanding their job fields, specialties, and job situations. They select lesson materials, vocabulary and phrases accordingly. This is what we are very proud of: Our friendly ECS instructors work diligently to offer their students the best possible customized lessons according to their situations and needs for learning. How to quickly and effectively communicate your opinions to your coworkers and superiors at business meetings. How to use simple English effectively in various situations including daily communications with coworkers, and oral reports to give to your superiors so that you will earn trust and respect. How to talk concisely and effectively during business calls and phone conferences so that you can negotiate to your advantage on the phone. How to create effective oral presentations and negotiate to your advantage during face to face interactions. How to write business proposals, reports, and correspondence using appropriate and relevant wording with concrete examples. How to have comfortable interaction with clients in a variety of settings such as lunch meetings and receptions by helping you to understand social and business etiquettes. How to discuss current news. Photo from ECS Daily Conversation Class (Private lesson). One-on-one/face-to-face settings allow students and instructors to establish a relationship of mutual trust between them. Communication skill will be improved through a lively conversation in addition to the classroom materials. 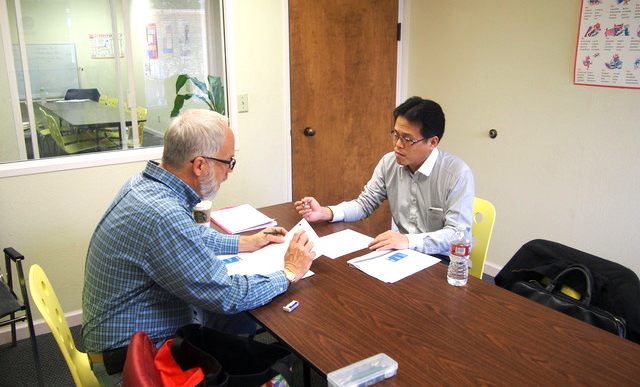 In answer to the need to “learn English I can use now,” at ECS you will practice conversations created by envisioning many day to day situations you might find yourself in and learning the relevant phrases and vocabulary. We believe that it isn’t about whether or not you can “speak” English, it’s about whether or not you can “use” English. ECS instructors strive to individualize each student’s lessons by understanding their job fields, specialties, and job situations. They select lesson materials and vocabulary accordingly. This is what we are very proud of: Our friendly ECS instructors work diligently to offer their students the best possible customized lessons according to their situations and needs for learning. Everyday greetings, common simple interactions, and how to introduce yourself. Ways to communicate effectively in everyday places like the grocery store, the bank, the post office, the hospital, a restaurant, and also on vacation at hotels and train or bus stations. How to communicate with teachers and other parents at your child’s school. How to speak with your landlord or building manager about your rental agreement. Phrases and words you will want to know in the case of a car accident. Small talk for meals and parties – ways to talk about your country's culture and ways to learn American culture. How to write inquiry and complaint emails, greeting cards etc. Photo from Lesson Buffet Class (Group lesson).Friendly and relaxed atmosphere of small group lessons make English learning enjoyable. Learning from each other, students are motivated to become better learners. This course was born from the desire to support those who work hard to improve their English language skills. This plan is unique to ECS, and we recommend it to those who want to improve their English skills in a short period of time. 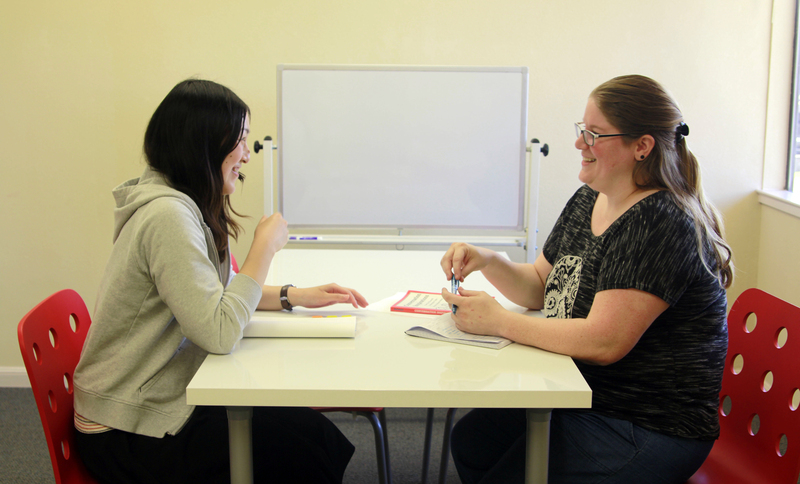 It will help you to quickly grow accustomed to hearing English through intense exposure. The majority of the lessons cover everyday conversation. Our instructors have prepared lessons based on the many situations that can arise in everyday life. Teachers change from class to class, so this is also a good opportunity to improve listening skills by hearing many different teachers speak English – one of the reasons this course is so popular. *The above class levels are not the levels of the students in attendance, but rather the level of the materials used in the class. It is therefore possible for beginners and intermediate level students to participate in all six hours of instruction. *Class Instructors are subject to change without prior notice. Photo from ECS Daily Conversation Class (Private lesson). 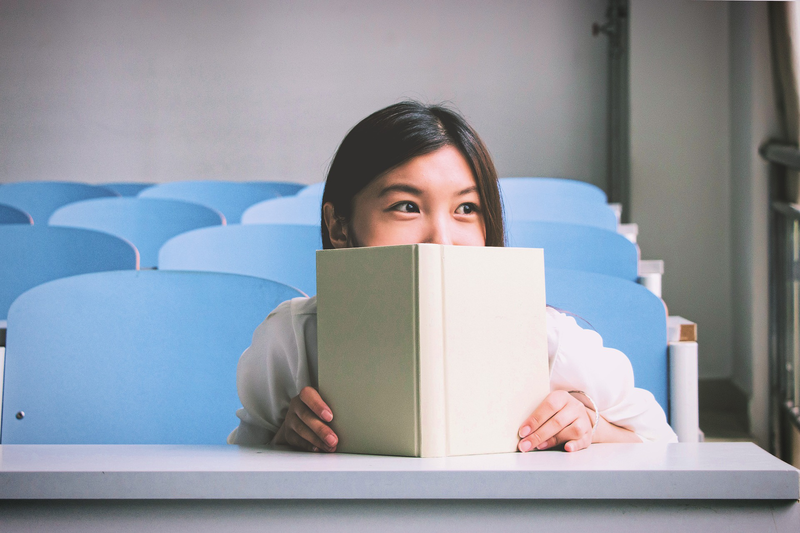 Children can conquer their unwillingness toward English language. ECS instructors give careful attention to each child to maximize their possibility and help them to gain confidence. Our teachers guide the students according to their age, English level, study goals and help them to strengthen their reading and listening skills, gain a breadth of phrases and vocabulary, and improve their conversation skills. Our teachers also offer advice on how to speak with friends, classmates, teachers, and school staff – subjects that aren’t often taught. Please ask us about lessons for preschool students and on-site homework support. Photo from ECS Kids Summer Class (Group lesson).Through various activities students are learning and having fun. This class is for your child who has difficulty in the local school due to the language barrier and for your child who might otherwise forget during the long summer break the English language skills that he/she has already acquired. 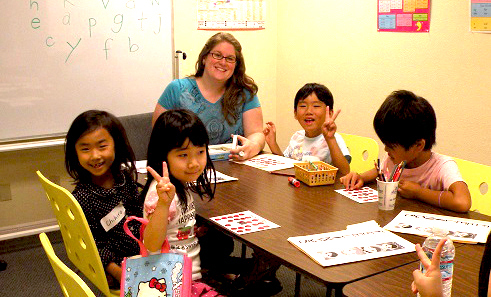 We offer classes for different age groups to achieve their age-appropriate mastery of the English language. The class registration starts late March to early April. There are also some possibilities that we can create a special class for those who wish to attend our class with your friends as a group. Please ask us! *Lesson fee for short term plan(less than 60 days) or company workshops is different than above. For details, please contact the ECS office. Group（3-4 people）Tuition *The price is for per person.